What is Trueview video Campaign? Trueview is a YouTube video ad format that gives the viewer option,the most common of which is the ability to skip advertisement after five second Video Campaign is a way to rank your video top in the search engine result and also add your website with the video to advertise your business.Now a days video campaign is very popular all over the world.The worlds popular hosting companies like godaddy.com,ipage.com,hostgator.com,bikroy.com and many other companies spreading there business by video campaign from google Trueview ad system. In streams ads allow viewer to skip the pre-roll ads after 5 seconds.Sponsors pay only for ads that are viewed in there entirety or until 30seconds that elapsed. 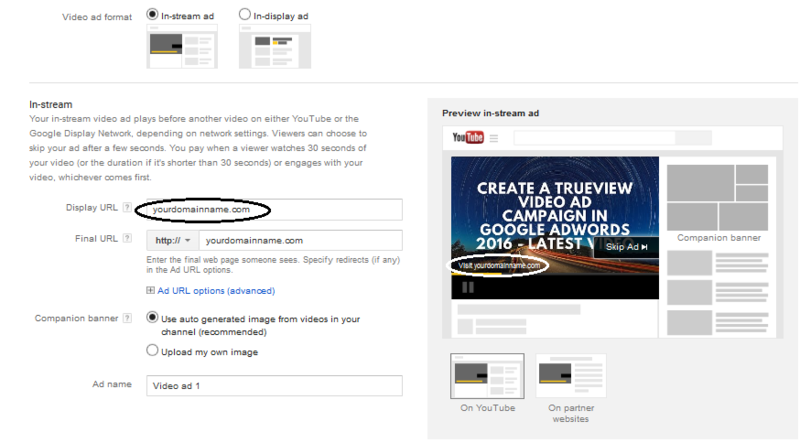 In stream ads are suitable for short or long video content. In-slate ad allow viewer to among several sponsors ad or opt to commercial break interspersed through the video content.Sponsors pay for ads that the selected by the viewer.In-slate ads are suitable for video that are at least 10 minutes long. 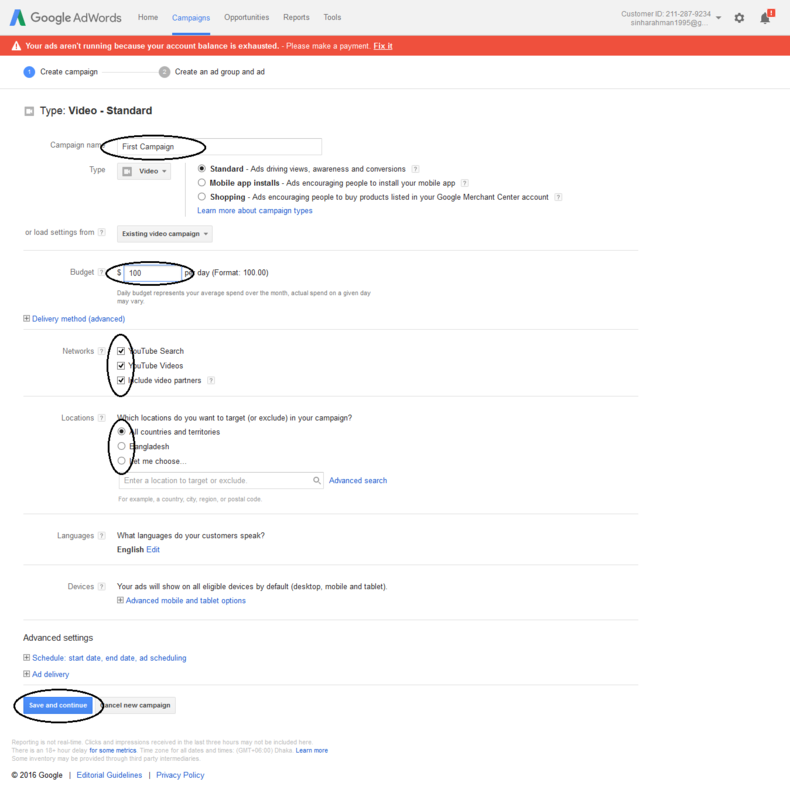 In search appears in YouTube search result when the viewer search related to the ad’s keywords.Sponsors pay for ads when the viewer begins to watch. In-display ads are legacy format that appear in the YouTube promoted video overlay,in video suggestions and related videos and google click to play format.Sponsors are charged when viewer opt to watch on ads. It’s very simple if you follow my steps. #3 After selecting video it will show this page.Here you have to give a campaign name then select your daily budget for ad in one day I choose 100$ you can choose your budget.After that check all networks.Then select your location where you want to advertise your product you can select all countries or any individuals countries.After that you click save and continue button. (if you not understand do it like the image below). #4 When you click save and continue it will appear in this page.Now write your group name in the ad group name section and copy a YouTube video URL and paste it your video section.This video will show your ads. #4 after pasting video URL you will see video ad format two option first one is stream ad and last one is display ads if you have a video to advertise the select the stream ad and if you have a image to advertise then select display ad.Display ad will show the advertise in the right side bar. 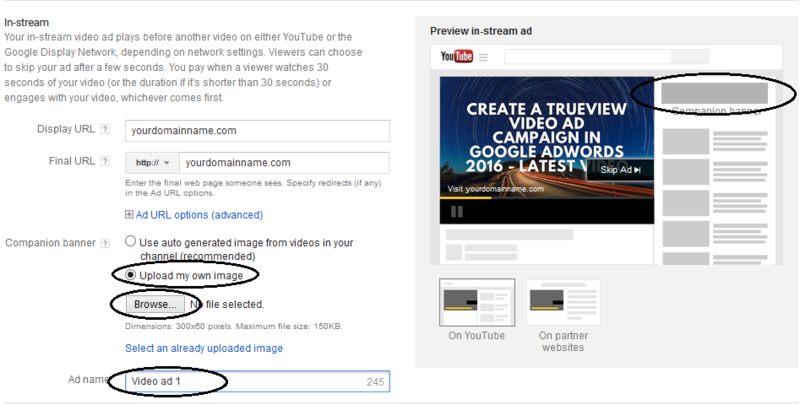 In stream ad you have to give your website link in display URL which will be show on the bottom-left of the video. #5 In Companion Banner you can choose your banner by selecting upload own images then choose your banner from you file manager.The banner will show in the right side bar of the video.Remember the dimension maximum 300×50 pixel and maximum file size 150kb.You can also add video name in the Ad name section. #6 In the Bidding area you can choose Maximum CPV(cost per Click) that will cost when viewer click your ad. 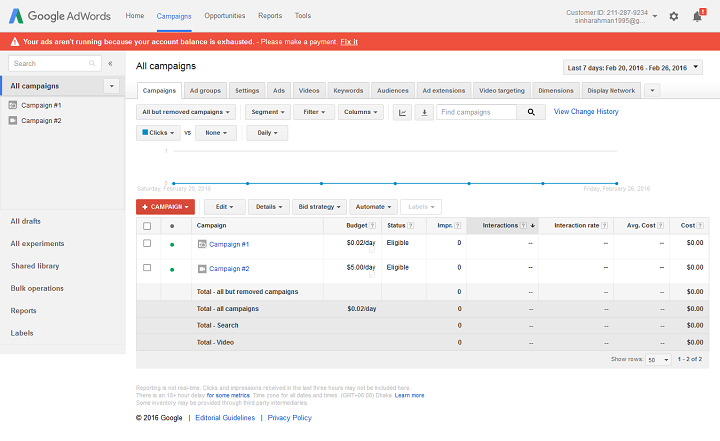 Google will charge this amount for advertising.In the right side you will be able to see how many people can click your ad daily by this budget. after that click Save ad group. 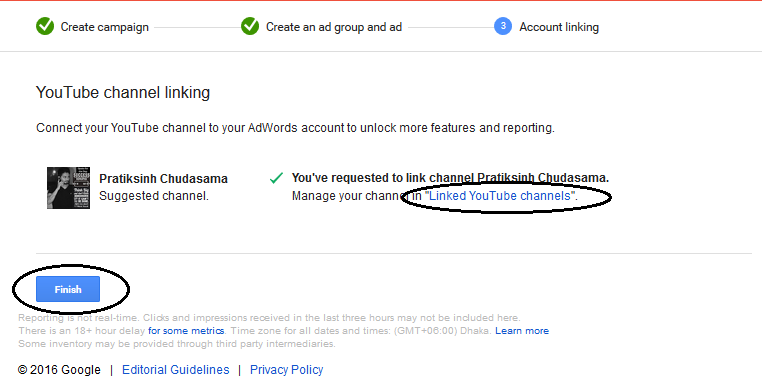 #7 In Account Linking area you just click the Linked YouTube channels.Then link the YouTube channel there by copy and pasting YouTube channel’s link and click the Button Finish. 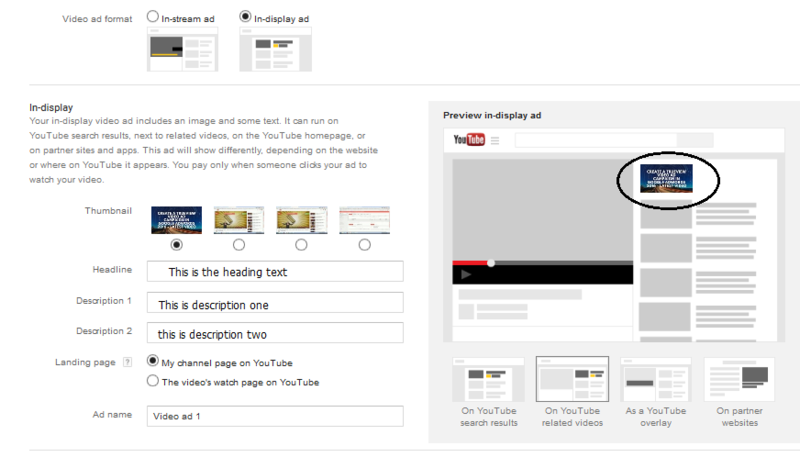 After That your job is finish.Now any one can found your ad by searching related keywords in YouTube search engine. If you have any question about this post you must comment below.